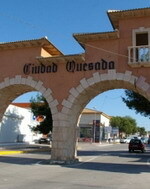 Ciudad Quesada - Just ten miles away from Torrevieja, with shops, bars, restaurants, golf course and its own water park. Alicante and Murcia airports are 30 miles and the nearest beach is within 10 minutes drive away. Many professional golf courses, Villamartin, Las ramblas and Campoamar. The local water park, Torrevieja town and open markets are open every day during the Summer months. Casa Davleen. Situated in Quesada & Close to Golf . Luxury detached Villa. 2 Bed, 2 bathrooms , large lounge, spacious kitchen, Al fresco dining. Private pool with terraces & gardens. close enough to all local amenities. The golf course is just a few minutes drive or 6-8 mins walk. Our Villa is very modern, clean, bright & spacious. All furnishings are of a very high standard. Large selection of videos, DVDs, cds & books. Private 400m2 plot with kidney shaped 8x5m2 swimming pool (newly constructed Aug 2007). This is not a shared pool. Garden & terraced areas with patio furniture, parasols & sun loungers. Sleeps 4. 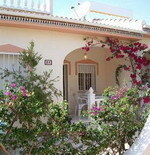 A modern fully-furnished two bedroom, two bathroom, bungalow situated at Dona Pepa. The master bedroom is a double bedroom with built-in double wardrobe, air-conditioning, en-suite shower room, toilet, and bidet. The other bedroom is a twin bedded room with a built-in wardrobe, a separate shower room, toilet, and bidet. In addition there is a comfortable divan bed, in the lounge, which can sleep a further two. A cot for an infant can be arranged upon request. There is a lounge/dining area with a satellite television receiving English channels, set atop a large sideboard. This room features a ceiling fan and a wall-mounted heater. The American style kitchen is fully equipped with an electric oven/hob, microwave, fridge/freezer, kettle, coffee maker and toaster. Sleeps 6. Elegant detached villa with its own swimming pool and jacuzzi. Situated in a quiet exclusive area but within 3 minutes walking distance of the lively town of Quesada and 7 minutes drive from the beautiful sandy beaches of Guardamar and Torrevieja. You are also a few minutes from two world-class golf courses and a bowling club. Comfortable and fully furnished for 6. Air conditioning system with cold or hot air. Disabled friendly. Good for children and babies. It has 3x bedrooms 1x double and 2 x twins and 1 luxury bathroom with twin basin and separate large shower area. Spacious open plan living and dining area with Satellite TV (English channels). DVD, contemporary gas fire and well equipped kitchen. 8mX5m integral swimming pool and jacuzzi with internal lights for swimming at any time. Large covered patio area suitable for relaxation or dining. Large front and side garden with palm and fruit trees. Roof solarium and private driveway for parking. Sleeps 6.